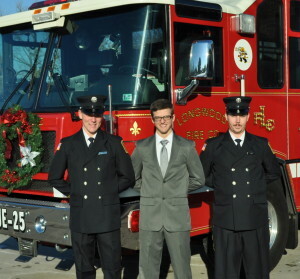 Bas de Vries (from left), Corey Denton and Chuck Simmers are new members of the Longwood Fire Company. The Longwood Fire Company is pleased to announce that three new firefighters have joined its ranks. A graduation ceremony for Corey Denton, Bas de Vries, and Chuck Simmers took place on Dec. 12 at the Wagontown Fire Company. The graduates completed a 10-week course that included 174 hours of instruction at the Chester County Fire School.